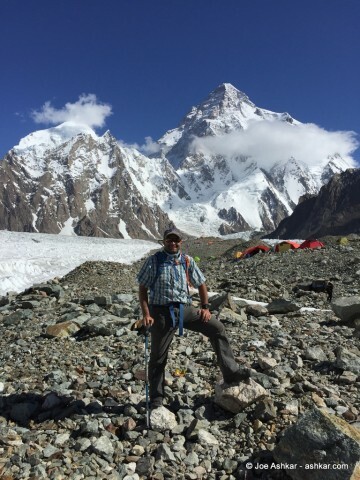 We made it to K2 Base Camp and that final leg of the trek was memorable. 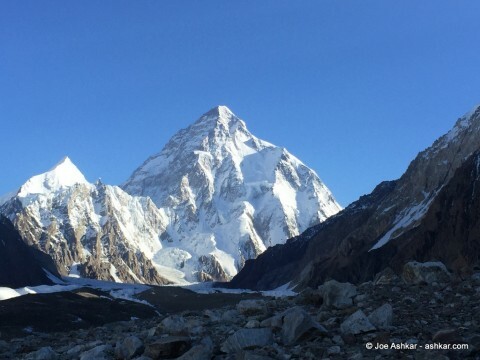 We started walking at 5:00 AM and the light on K2 was simply amazing. Seduced by the magical beaty of this mountain, I elected to take the straight through trail down the glacier instead of the moraine as if being directly attracted to the mountain. Vanessa O’Brien was following me until we realized that path would get a lot tougher and would require an impossible crossing of the glacier. We turned to the right and climbed up the moraine and took the normal trail to Base Camp. As my friend Alan Arnette had mentioned to me while discussing K2 on our Everest/Lhotse Expedition, the trail provided many obstacles in terms of footing on different surfaces; but mainly the one I remember Alan talking about was the sharp rocks litereally shredding my robust trekking boots. 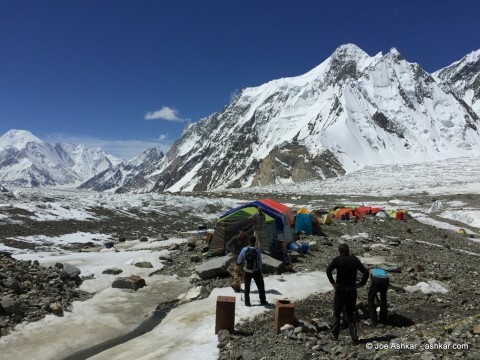 Despite the 45 minutes detour, we made it to Broad Peak Base Camp in 2.5 hours and an hour later we arrived at K2 Base Camp. The tough 75 miles/120 Kilometers journey was over. Getting to K2 Base Camp is a feat in its own and only surpassed by my trek trough the Indonesia/Papua Jungle on the was to Carstensz Pyramid Base Camp. There were a lot of happy faces amongst our group knowing we base to the base of K2. We will now take a couple of days rest to get settled in and acclimatized before we go up on our first rotation to Advanced Base Camp, Camps 1 and 2.